Colour, Appearance, Separation and Thickening. Colour: nails may become green, yellow or brown. Also, underneath the surface of the nail small red or white spots may appear. Appearance: nails may become streaked. One can often observe the appearance of grooves or punctures on the surface of the nail. Separation: chalky materials can accumulate under your nail and consequently cause the nail to detach from the nail bed, which causes pain and discomfort. 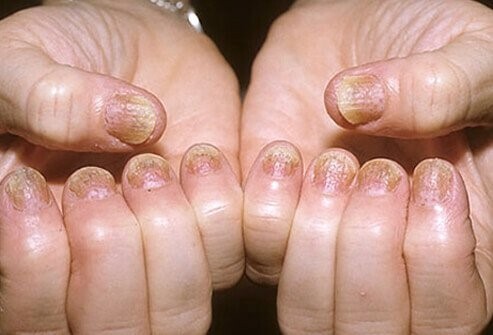 Thickening: About one-third of people with psoriasis on nails suffer from fungal infections that cause nail thickening, breaks and cracks. Some of these changes in nails can reduce the mobility of your fingers and toes. You may also experience sensitivity and pain in the nails. This can make it difficult to make any moves with your hands. In order to treat nail psoriasis we have developed a special kit to help clean the affected area and strengthen your nails naturally. 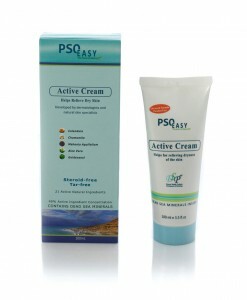 The Nail Treatment Kit is a complete treatment for Nail Psoriasis diseases. With this kit you save $6.90 + Free Delivery compared to buying all the products separately. Follow these steps to help treat your nail psoriasis. 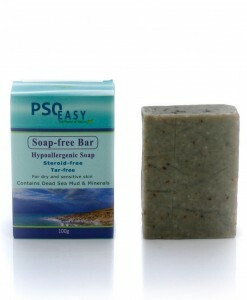 PsoEasy Hypo-Allergenic Soap Bar – this 100% natural soap, handmade and based on traditional methods and its antibacterial properties ensure the cleansing and purification of nails and damaged skin around the nails. The unique combination of powerful active plant extracts, algae and Dead Sea Silt ensures the soap can penetrate skin pores, cleanse and purify skin thoroughly, renew the cells of the epidermis and restore the external appearance of nails. 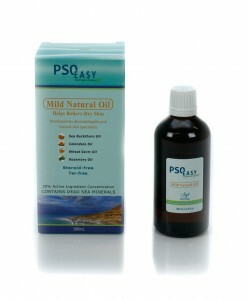 PsoEasy Natural Mild Oil– is designed to improve the overall condition of your nail psoriasis. The oil is made from a unique combination of plant extracts and Dead Sea minerals, which have been shown to be effective in the treatment of nail psoriasis, relieving dryness, improving hydration and softness levels. Mild Natural Oil contains natural ingredients including: Sea Buckthorn Oil, Tea Tree Oil, Wheat Germ Oil, Grape Seed Oil and Dead Sea minerals – well known for their skin purifying, strengthening and healing properties.